The Kingdom Hearts III team plans to take advantage of many possibilities they could not take on the PS2. The "Dark Seeker" saga of Kingdom Hearts has gone on for over a decade. In that time, videogames have continuously been evolving. With the capabilities of the PS4 and Xbox One, Kingdom Hearts director Tetsuya Nomura and the rest of his team will be working to make Kingdom Hearts III more dynamic. "I think when you look at screens of what's currently in development, you can get a good feel of the depth that will be possible to have as a console title," Nomura said in a Creator's Interview video series. Famitsu published a transcript of the video interview. "For mobile [portable] releases, we're pretty limited in the amount of information we can convey, but console versions make it possible to have a wider field of vision. It's been a while since Kingdom Hearts was on a home console, so I believe its [increased] scale will be considerably noticeable." Kingdom Hearts II released in Japan in 2005 (2006 in the rest of the world), and since then each game in the series has been on a handheld device. Kingdom Hearts III's gameplay will stick to the base of Kingdom Hearts I and II, but it will implement some of the "bold actions" and "special systems" first applied in spin-off titles. 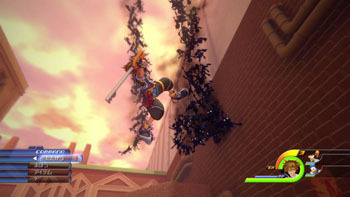 Sora will run and fly around like before, but his mobility and control will be smoother. "There will be action characteristics that will allow you to fly as far as you want, if you actually try doing it," Nomura said. "While there will be some sort of limit, this time, there will be the 'Free Run' feature that is seen in other action games as of late that will allow you to run and climb all over the place." Nomura added that the game has something even more mobile than Sora's Final Form in Kingdom Hearts II. In the past, the series has not used a brush-style texture to replicate Disney's 2D work to 3D due to hardware capabilities, but Nomura said the team will do this for Kingdom Hearts III. Nomura would like to use the touchpad on the DualShock 4, but has not decided on anything yet. The game will also be released for the Xbox One -- something the team needs to keep in mind, too. "Since we now have so many things we can do, it can be a little overwhelming."